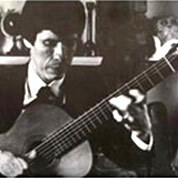 Gentil Montaña born in Ibagué, was a classical guitarist and composer from Colombia. Most notable among his compositions are four suites for guitar which include several popular Colombian dances such as the Bambuco, Guabina and Porro, as well as other Latin American dances such as the Cancion. Son of Dolores López Morales and Tulio, was one of the most important Colombian composers, besides being one of the more plays left. Always characterized by its elegance, as well as his musical talent. It was the first composer in Colombia to protest songs, with the song Yesterday I drove the old Pueblito people and these were his best known songs throughout Colombia, which is then spread around the world in several languages ​​including English, French, and so on. Luis Antonio Calvo was one of the greatest figures of Colombian music. The work of Luis Antonio Calvo is formed by an enormous amount of musical compositions in various genres, Colombia and abroad.